When are winter tires or chains right for you? Good question – glad you asked. With tire/chain requirements in effect as of October 1 on most B.C. highways, we want to clear up any confusion so you can get your mind back on the road this winter. To help you — and by “you,” we mean passenger vehicle drivers and commercial truck drivers — navigate your winter tread and chain needs, we recently updated our Winter Tires and Chains website, which guides you through depending on the vehicle you drive and where you drive it. So, what is a winter tire? Is it one with a three-peaked mountain and snowflake symbol? How about M+S (mud and snow) tires? We recently assessed the existing definition of “winter tires and chains” as part of the highway speed and safety review. There are six things you need to know now. The RCMP and the Ministry of Transportation and Infrastructure agree that for winter driving conditions a tire with a 3-peaked mountain and snowflake symbol is the best choice. We encourage passenger vehicle drivers to choose the best tires possible, and to ensure the tires are in good condition, with good treads, and by that we mean tires having a minimum tread depth of 3.5 mm (greater tread depth is recommended). The legislation as written accommodates M+S tires. B.C. RCMP will continue with past practice of allowing either tires with a mountain/snowflake symbol or a mud and snow designation on highways where winter tires are required, as long as they are in good condition, with good treads (worth repeating)*. Meanwhile, commercial vehicles greater than 11,794 GVW must carry chains along these routes, however trucks between 5,500 kg and 11,794 kg GVW may use M+S or mountain/snowflake tires, or chains. If you’re a commercial driver, see our detailed chainup information for your work vehicle. Where Must I Have Winter Tires? We are only talking about the highways where the signage is – on the mountain passes in B.C. and in areas subject to winter conditions including the interior and north. We are not talking about drivers in the city limits. A maps of the designated highways where motorists must have winter tires or chains are available for the Northern, Southern Interior, and South Coast regions. In severe winter weather, police officers may turn vehicles around, regardless of the type of winter tire they are using, if they feel the tires are unsafe for the conditions and may be putting the driver at risk. Where Do I Get More Information About Winter Tires? Contact your tire manufacturer or local tire shop to discuss your tire needs and the best choice for safe winter driving. Since more than 60 per cent of all B.C. drivers travel the province in places where snow rarely falls, the ministry does not require all drivers to equip their vehicles with winter tires. The new Winter Tires and Chains website will help you determine your specific needs based on what and where you drive. In a nutshell: Between October 1st and March 31st, passenger vehicles are legally required to have M+S or mountain/snowflake tires*, and commercial vehicles must carry suitable chains while travelling on highways designated with winter travel signs. And remember, if you have to get out on the highways, DriveBC and our webcams are great ways to be informed about the weather and road conditions for your route. Winter weather is approaching… Are you prepared? *The law applies to tires on the main drive axle. However, it is recommended drivers use four matching winter tires. my dad is going to be travelling to Ontario in a few days … if he needs to buy tires to be in compliance of the regulations does he need to buy 4 or can he just buy 2 tires. We recommend four matching tires, but two matching on the front and two matching on the rear are acceptable, although this can lead to uneven wear on the tires. You might also want to check in with other provincial authorities about their requirements as well. Hope that this helps! Safe travels. I have new tires on my hatchback with the M+S logo. I also have chains. I’m driving up the coquihalla to kelowna this weekend. As far as I’m reading my tires are acceptable, but the mountain and snowflake tires are the better choice. I just don’t have the money to go out and buy new tires. Thanks for sharing this information about your travels. Yes, mountain and snowflake tires would be preferable for your drive, depending on conditions. M+S tires are still legal, and the chains are a good idea to pack along and be ready to use. Given you’re driving a hatchback, I suggest you load as much weight as possible in the back of the car over the back tires. Eg. sandbags, heavy suitcases. This will give you a little more traction. Be sure to check DriveBC.ca to know before you, what the conditions are on the Coq. If it’s stormy or there’s a weather warning you may want to consider taking Hwy 3 to Hwy 97. This will take you longer but the route is at a lower elevation than the Coquihalla. I would like clarification specifically for the Malahat on Vancouver Island. I have been all over the BC Min of T website trying to find clarification. If I have snowflake winter tires on a passenger car must I also car chains or am I legal to cross? If I have M+S tires on a passenger vehicle and have chains am I legal to cross? I have an all wheel drive car with dedicated snowflake winter tires and no chains. I have a 4×4 truck with M+S tires plus chains. Please clarify if both of these vehicles are legal to cross the Malahat. Thank you. If you have any other questions – let us know! Is the winter tire and tire chains requirement being revised? I see some of the signs on different highways around the province now say October to April 30. Thanks for connecting with us here! 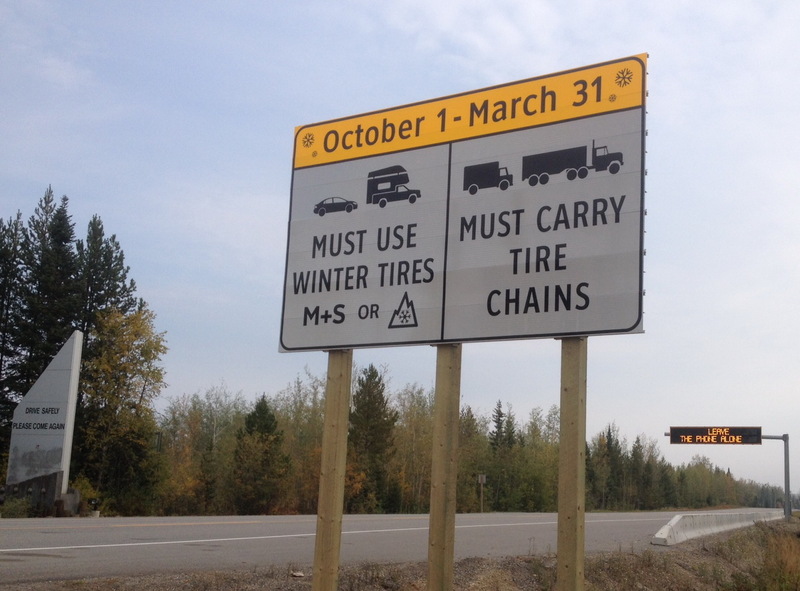 Existing dates on winter tire signs will remain in effect. Changes to other corridors will be updated following updates to the regulation for fall 2018. There were a few select signs already place in regions of the province that stated October 1 – April 30, due to locally specific weather conditions. Good morning Carl! Thanks for your question. Sounds like you will be well prepared to travel BC’s mountain passes. Cable chains are allowed on BC Highways, and we encourage you to know how to install them before you head out. You should also give yourself plenty of time to travel, pack extra food and water (in case you are stopped unexpectedly) and remember to check DriveBC.ca – our traveller information website. The ‘winter tire and chains’ link ‘cannot be found.’ Several of the links I’ve tried to open on your website are not leading to the information advertised. I hope this can be solved quickly. Thank you. Thank you for letting us know. We have updated the link you mentioned in this blog. We recently updated some of our content and unfortunately, some of the links did break. We are working towards updating all of them, but it is taking a bit of time. If there are other links specifically you would like to bring to our attention, let us know. Thanks again! A co-worker of mine advised that I might need winter tires and chain since I’m travelling to Montana. Is that still in effect? Hi there! I have to drive from Vancouver to lions bay this Friday for a gathering at a cabin.we have had quite the snowfall this year and it’s taken me by surprise! Which got me researching…the map isn’t clear as to where the winter tires area goes into effect. I can only find maps that don’t let u zoom in to see the start area.Will my all seasons be ok or will I be entering the snow tire area and need to hitch a ride with my friends who have winter tires. I don’t want to be driving where I have to have snow tires but I can’t afford a new set of tires and I’m not sure if my tread is deep enough as it is a hand me down vehicle. Hi Christina. Thanks for checking in with us. Winter tires (mountain/snowflake symbol) or Mud and Snow tires (M+S symbol) are required on the Sea to Sky Highway. Check your tires’ sidewall – there’s a good chance your vehicle has M+S tires. If you’re unsure about tread depth, it’s a good idea to pick up a tread gauge at a local store that carries auto products (they are inexpensive). Tread must be at least 3.5mm. Budget Rent a Car just told me their (winter) rentals have M&S tires. Isn’t it a legal requirement they provide Winter Tires? Thanks! Hi, we have realised the car we have borrowed from a family member does not have winter tires. We plan on driving it out of whistler as they now need the car back and live in chilliwack.what is the legislation for a vehicle leaving the winter tire area as we don’t want to spend money on winter tires when they do not need them for where they live. Will there be any leniencies “if” pulled over when the temperature for consecutive days will be warmer than it’s safe to operate winter tires? I have been in a car that was written off because it couldn’t stop in time on a hot road surface which made the winter tires turn to mush. Should the vehicle I was in have had non-winter tires that are more optimal for a warmer temperature, the vehicle could have stopped in time or lessened the impact. I’m from the Greater Vancouver area, so I am specifically concerned about the Sea to Sky Highway location. This week temperatures are much higher than winter tires are recommended to be operated at. Most tires that are not designated M+S will outperform M+S rated tires in higher temperatures which therefore adds to the safety of the vehicle and others around the vehicle. Winter tires used in warm weather not only cost the owner more money but assist in doing the opposite of keeping this province green. I know this regulation is put in place to cover the “closest” worst case scenario and citizens that have very little to no common sense. I am all for safety but with added common sense. Human beings don’t live black and white lives and this law should give us drivers the right to exercise caution and our own common sense, especially when this particular regulation forces us to operate a motor vehicle in unsafe conditions. Give tickets when the road conditions are soon becoming dangerous for the tires mounted on the motor vehicle. But don’t check tires if it’s 16C during a beautiful sunny October weekend with night time lows where it’s soon unsafe for summer tires to operate. Thanks for your comment. This transition season is a tricky one for winter tires, which is why we allow the use of M+S tires with sufficient tread. Unfortunately, not all drivers on BC highways always exercise common sense, and because safety is our first priority, we have to aim for that lowest common denominator to ensure the safety of all travellers. Hope that this helps. I just hope that RCMP will exercise their common sense when conditions are safer with summer tires than with winters. If that is done, then the roads will be safe for the drivers who have no clue, as well as safe for the drivers who have great knowledge and common sense. every single link to the page that tells you what highways are involved in the new law goes nowhere. How is someone able to get this information if the information is not available. I would expect more from the transportation department. Sorry to hear this. We checked all the links in this blog and they worked for us. Is there another page we can look into for you? What a different between winter or chains tire. Chains tire is very useful or winter tire? If you recommended me right way otherwise i can use your blog carefully. Winter road conditions across most of B.C. often include snow and ice. We recommend drivers install mountain/snowflake tires for cold weather driving and, for extreme conditions, carry chains. It is the responsibility for the operator of a vehicle to understand the conditions on the roads they regularly drive and equip their vehicle for those conditions. British Columbia accepts tires displaying the 3-peaked mountain and snowflake symbol OR the M+S (mud and snow) symbol, with at least 3.5 mm tread as winter tires. Some tire manufacturers choose to mark their tires with both designations. These winter tires offer the best traction on snow and ice, and in cold weather. Drivers may wish to enhance the traction of their winter tires by carrying chains or using other traction devices. Summer tires are NOT recommended for winter driving October 1 to March 31. Chains on summer tires are not an acceptable substitute for winter tires on signed highways. I drive a normal SUV without winter tires. If I purchase proper chains and attach to my vehicle, will I be compliant? I’m having trouble finding proper guidance if I can purchase chains instead of putting on winter tires. Appreciate if you could reply to my concern. We suggest you check your vehicle tires first. British Columbia accepts tires displaying the 3-peaked mountain and snowflake symbol OR the M+S (mud and snow) symbol, with at least 3.5 mm tread as winter tires. Many all season tires have the M+S logo on them. If your tires have the symbol and sufficient tread (here’s a video on how to check tread depth) you can travel on BC highways with winter tire requirements. We do recommend carrying chains and knowing how to use them in case extreme weather presents itself to you on your trip. Check DriveBC and know before you go. Hope that this helps! I see someone has already asked the question but the editor avoided answering. Why are rental companies not required to put the required tires on their cars? Quebec requires rental companies to conform. Is it possible that province is more concerned about supporting tourism. Rental companies are required to equip vehicles with at least M+S tires, which are legal on all BC highways. If I bring tire chains to Whistler in November, but do not have snow tires; is it good enough? Will I get a ticket then? Chains on summer tires are not an acceptable substitute for winter tires on signed highways. If your tires are all season, and you they have the M+S logo and a minimum tire tread depth of 3.5 mm – you can drive the highway without risk of penalty. Hope that this helps and should you have any other questions or concerns, let us know. Thanks! Thanks for connecting with us here. The type of chain up configuration you will need depends on the size and type of truck you have rented. Commercial trucks weighing more than 5,000 kg GVW do not tend to use winter tires. Do you know the GVW and axle configuration of the truck? Here’s a link to a video on how to chain up and a visual to help you better understand your specific chain up requirements. Good practice is to keep chains on board at all times, and know how to install them. Hope that this helps! Hello TransBC Editor, We are travelling from Nanaimo to Tofino via rental car next April 5th and our Tofino hotel website lists the Winter tire requirement on Route 4/Pacific Rim Highway as being from October 1 – April 30th. Your site lists it as only through March 31st (and I am unable to open any map links). Are there different date ranges by location for this requirement or is their website incorrect and the requirement is only through March 31 in all of BC? Please also check our traveller information website DriveBC for up to the minute road condition information and webcam visuals on Highway 4, so that you can know what conditions lie ahead on your journey. Safe travels and enjoy the West Coast! Regarding the link – we wonder if you are having troubles opening the link because of the browser you are using? Have you tried others (Firefox, Chrome, Explorer)? Hope that this helps! Thanks BC Editor — Appreciate the clarification and the Sage advice. Can I just carry a set of chains to use on my AWD vehicle with all season tires? If your all season tires are rated M+S and have a minimum of 3.5 mm of tread they should be fine to use without chains. Are winter tires required for rental cars during the winter period? Very few rental cars have winter tires. Why are rental car company’s not required to have snow tires on rental vehicles when the cars are required to have them when on the roads? The winter tire law applies to all cars in BC and there is no exemption for rentals. Current legislation allows an M + S tire with minimum 3.5 mm tread as a winter tire. Thanks for connecting with us here. Non BC residents traveling through the province for a couple of days. Are we required to purchase winter tires? Money in B.C. I’ll take the $2000 I’ll save on new tires and go to Palm Springs. Sorry you feel that way, Wojo. Safety is our biggest priority, for you and for the other drivers on our highways. I’ve looked through all the posts I can find on this and do not see any details on which wheels requrie M+S or snow tires. I assume that the requirement for snow tires is only applicable to the drive wheels (i.e. back tires on a rear wheel drive car & front tires on front wheel drive). Can anyone clarify this for me? Specifically to your question though: You must have at least 2 matching winter tires on the same axle, but we recommend using 4 matching tires – even when driving a 4X4 vehicle. I believe in winter tires and have often witnessed the need for them. When we lived in Muskoka we used snow tires and now here in Waterloo – ice tires. I’ve been trying to find out when the use of snow tires began. I do not recall them when I was young. Are you wondering when they began in BC? Canada? Travelling to canada in a commercial vehicle.How many tire chains are required to be carried in BC and is the placement of the chains specific? You guys really need to get your act together and know the FACTS! I have been in the tire industry for many years and I will clarify for the record, before this ridiculous flaw gets someone killed. Each and every “all-SEASON” tire bears the M+S logo. However “all-WEATHER” tires bear the “Mountain & Snowflake” symbol, which should be the new “minimum” for the designated areas with the R-047 or W-041 signs. You need to understand that there are many different types of all-season tires. For example, there are “Touring” all-season tires (which usually have a S, T or H speed rating) and there are also “Ultra High Performance” (UHP) All-season tires (which usually are V, W or Y speed ratings). Please keep in mind that ALL of these have the M+S logo on the side of the tire. But I can tell you as clear as day, there are some all-seasons that will not move nor have control in even the slightest amount of snow or ice even when they are brand new. Please read this article from TireRack giving a much further in-depth detail on M+S vs the Mountain & Snowflake symbols. “The original definition of M+S tires is based on the geometry of the tread design. The M+S designation was first used to differentiate the knobby, bias ply tires intended for use on muddy and/or snow-covered roads from the straight rib tires used on early cars or trucks. Tires with tread designs that meet the definition may be branded with the letters “M” and “S” in several different ways (e.g., M&S, M+S, M/S, MS, etc.) at the discretion of the tire manufacturer. When early radial ply tires were also found to deliver more snow traction than the straight rib, bias ply tires, the tire companies introduced all-season tires. Supported by advertising, all-season tires have presented an unspoken promise that they, throughout their life, can provide traction for all seasons…through spring’s rain, summer’s heat, fall’s cooling and winter’s snow. While this combined offering has made all-season tires popular, many drivers have learned that a geometric definition doesn’t guarantee winter snow and ice traction. In 1999, The U.S. Rubber Manufacturers Association (RMA) and the Rubber Association of Canada (RAC) agreed on a performance based standard to identify passenger and light truck tires that attain a traction index equal to, or greater than 110 (compared to a reference tire which is rated 100) during the specified American Society for Testing and Materials traction tests on packed snow. The new standard helps ensure that drivers can easily identify tires that provide a higher level of snow traction. A mountain/snowflake symbol branded on the tire’s sidewall identifies tires that met the required performance in snow testing. The mountain/snowflake symbol is expected to be fully implemented on new tires by now, however there still may be a few winter/snow tires in the marketplace that meet the requirements but were produced in molds manufactured before the symbol was developed. While dedicated winter/snow tires bearing the mountain/snowflake symbol are available in sizes for most passenger cars and minivans, the wide range of sizes and load ranges for tires used on crossover vehicles, sport utility vehicles, pickup trucks and full size vans encouraged Quebec to temporarily expand its definition of acceptable tires to implement this law. Alternate tires not bearing the mountain/snowflake symbol which have one or more of the following terms branded in their tire name or tire size are temporarily acceptable: Alaska, Arctic, A/T or AT Blizzard, Ice, LT, Nordic, Snow (but not mud and snow), Stud, Ultratraction or Winter. While the inclusion of LT in this list means that any LT-metric, Flotation LT or LT-numeric sized tire is acceptable, drivers facing challenging winter driving will be best served by selecting dedicated winter/snow tires, followed by On-/Off-Road All-Terrain or Commercial Traction tires. Starting December 15, 2014, the Highway Safety Code regulation specifies only tires bearing the mountain/snowflake symbol will be considered acceptable winter/snow tires in Quebec. Winter in British Columbia ranges from wet/mild to snow/freezing. We encourage drivers to be prepared, while at the same time, recognizing there are many times when the roads are not covered in snow and ice — people can make the most appropriate tire choices for when and where they decide to drive. While M+S is the minimum requirement on signed highways, we recommend mountain/snowflake tires and driving to the conditions. M+S tires are also acceptable in our neighbouring jurisdictions of Alberta and Washington. Point taken “Concerned Citizen”, but my experience has taught me to be very careful with “All Weather” tires that show the mountain snowflake symbol. I had a set of Nokians that were rated “All Weather” a few years ago when I lived in the lower mainland and occasionally drove to Prince George. I found them to be good for this and well suited to the occasional warm snow and slush in the lower mainland. When however, I moved to PG, I found them to have almost no benefit over my All Season Tires on Ice in very cold (-20C) temperatures, because the compound has to be hard enough to last reasonably throughout the Summers. If you mainly drive in conditions where there is snow, but not extreme cold, I would say they are a good compromise, but if you drive on ice at -20C or colder, I would avoid any tire that is intended to be used year-round including M&S Tires. Instead, get a good set of dedicated soft-compound winter tires for the 6 months of winter up here. Put them on their own rims if you want to protect them for a few seasons of use. If you live in the North, you will know that you also want them studded for a bit more bite – unless you are buying the very best and latest ice tires. I have run Gen Tire Altimax Arctics, Hankook iPikes, Cooper/Dean Wintercats & Arctic Claws and studded, they have all served me much better than the unstudded Nokian All-Weathers I used previously – at least up here. but the page never opens no matter how long I wait for it. Is there somewhere else I can get current information about what is required for tires on a Dodge Ram 3500 diesel truck driving the Rogers Pass at Christmas time – to Calgary from Vancouver and back again. The link you are trying to connect with is our Winter Tires and Chains website. Here is a page from the site which you might want to try loading:http://www2.gov.bc.ca/gov/topic.page?id=30A822ACDFA64134B3E8B923CBFB2471. With regards to your truck – will you be towing anything or just travelling with your truck? If you are travelling only with your truck, we recommend mountain snowflake tires with a minimum tread depth of 3.5 mm. If you will be towing – we recommend you carry chains and be prepared to use them. As always, please check our traveller information site http://www.drivebc.ca/ and watch for changing road conditions and events on the route you plan on travelling. Hope that this helps and if you have any other questions or concerns, do not hesitate to contact us again. IS there a distinction between the locations posted with “Warning” signs versus “Regulatory” signs? More to the point, is it possible to be fined for not having winter tires in the areas where only the “warning” signs appear? It seems that there must be a reason for the two types of sign. From what I’ve seen, the “Regulatory” signs only appear on high passes and other known snowy areas. As mentioned by others, there are short inter-city jaunts at low elevations (Trail to Castlegar, or Oliver to Osoyoos come to mind) where the temperature in October are often well over +20 Celsius. Surely the police won’t be doing “spot checks” on October first at the edges of Interior communities to hand out a flurry of $368 fines? The way it works is that the R-047 sign (the regulatory sign) establishes the regulation. We call these signs “Gateway” signs, as they are used at the start of highway segments to establish the winter tire regulation. Those routes where we have established the regulation with these gateway signs, are also shown on maps on our website: http://www2.gov.bc.ca/gov/topic.page?id=45404ACEC6B943F1B260D73072105E20. The warning sign is primarily used for 2 reasons. Reason 1) It is a confirmation sign (i.e. is to warn people that the Winter Tire regulation is in effect (with Gateway Signs)) along the route where these warning signs are posted. Reason 2) for use on non-numbered routes or minor roads that are controlled by the ministry. The signs in this case are used to let people know to be well prepared for winter conditions. Gateway signs are extremely expensive, as such the smaller warning signs provide some economies. Typically, the R-047 signs are placed outside of city limits, and in many cases outside the urban “interface” zone where people regularly commute between their homes and the downtown core. Our goal with our winter tire routes is to capture those people who are engaged in long distance rural travel, not those traveling around their town. In terms of winter tire enforcement, the ministry does not control the police practices. Consequently, the police are at liberty to enforce as they deem fit. A great deal of people exceed the posted speed limit, however the police do not seem to stop everyone for speeding. As with most BC Motor Vehicle Laws, I suspect that police forces do use some discretion in their enforcement – how they determine their discretion is not clear. The bottom line is that if you do a lot of rural travel in a snow-belt, this system has been provided for the protection of all travelers, the dates on the signs indicate when crash rates go up significantly. Many people believe the winter season starts with snow-fall, however icing conditions, especially with lower overnight temperatures start to show up on our road surfaces well before the snow flies. We hope that this helps. I have all season tires but no M&S. Is it OK if I run these through winter but carry chains, and when stopped or if encountering winter conditions put chains on? Am I glad that I found this blog. It seems that you are saying that I can use my summer tires here in Oliver if I don’t go out on a snowy day? Or ARE YOU saying that I have to have mud and snow right now. I live in Oliver, B.C. If I don’t use my car when there is snow on the ground may I still use my ordinary all season tires for non snow days? Will I be able to use my all season tires when winter is considered over? If I want to go to Vancouver I must use Mountain/mud and snow? I am very concerned about the new requirement because allow me to explain. I live in Otter Point which is just outside of Sooke. This same sign went up in Sooke just outside of the town core but still in Sooke’s boundaries. Sooke region along with Victoria hardly ever get any winter i.e. ice and snow. Very rare. Usually in January/February range. However I do put on winter tires… usually late October or early November to mid March or April. My concern is that if I understand this correctly, police can give me a ticket immediately on October 1st if I don’t have winter tires on? The problem is this past October and previous Octobers… we have had such a nice weather almost 20’c range. It seems like it is waste of using good winter tires when you don’t have to? It seems that the common sense should prevail that you should be able to put on winter tires for normal local regions rather than being told by this ‘one size fit all’ new sign for everywhere else in BC. Again the problem is Otter Point and Sooke are hardly “winter” zones and are very much similar to Langford or Victoria. I would think that some of these dates on these signs should be adjusted to where they are located in. Prince George would have way more winter and much longer winter than “balmy” Sooke would have? Is it not possible to maybe to adjust the date on the sign in Sooke to maybe November 1 to March 1 for absolute mandatory period while allowing the flexibility for people to decide when to put on M&S or winter tires before November 1 and when to take them off after March 1? Extra two months of unnecessary wear/tear on expensive winter tires would discourage people from buying winter tires in future and buy cheaper / less reliable M&S tires… would that not then increase public hazard issue? Lots of people can’t even afford winter tires so they use cheaper alternatives when at same time you should be encouraging people to have winter tires as the best possible tires? Thanks for sharing your concerns, Matthew. I’ve connected with our engineers who oversee the signs. They are reviewing the location of this particular sign. We’ll keep you posted when we hear back more. I guess common sense prevails. Well, I think this law has some flaws.I live in the Kamloops area and would like to do a trip to Falkland on a fall day in October. It is 18 degrees celcius.Now if I decide to go past the sign at Monty Lake, I am subject to fines and getting my bike towed on a day where the chance of snow is nil. Cray world we live in. As you might have heard, Minister Stone recently clarified that the M+S or winter snowflake logo requirement does not apply to motorcyclists. As you know tire manufacturers do not make winter tires for most motorcycles. Under the Transportation Act, the minister can, by placing signs, prohibit vehicles that are not equipped with winter tires from a highway. The signs do not show motorcycles. The minister said that motorcyclists must apply common sense and not travel in inclement conditions. In severe winter conditions, police may turn all vehicles around if they think the tires are unsafe for conditions; this includes motorcycles. Thanks for connecting with us here, we hope that this helps! Do you have an answer to Ryan’s question yet? I can’t find any information other than hearsay on how this law applies to motorcycles. Motorcycles must follow the same requirements for winter tires as passenger vehicles. So, they must be equipped with either mountain/snowflake or M+S tires. Only carrying chains on signed highways is not sufficient. So I can’t ride my motorcycle pretty much at all between Oct 1 – Mar 31 as I need to cross one of the listed highways? What if I carry chains?? Absurd yes, but they don’t make winter tires for my bike and no I don’t plan on riding when it’s below zero but Oct/Nov and March are my favorite riding months! We hear you. We are double checking with our traffic engineers to confirm how this law applies to motorcyclists. Stay tuned! I am in the same situation as Ryan. Any word on motorcycles on mountain roads after October 1? I’d hate to get a ticket from the local constabulary who’s trying to make his quota. Any update on the situation? I have a similar problem with my motorcycle and would like to know how this affects us. We responded below. Hope this answers your question. We confirmed that motorcycles must follow the same requirements for winter tires as passenger vehicles. So, they must be equipped with either mountain/snowflake or M+S tires. Only carrying chains on signed highways is not sufficient. So I guess that means I can’t commute over the Malahat on my bike without risking a ticket. Even if the ambient temp is +20? What a pile of crap, re Motorcycles requiring M&S tires. Yep, am sure all will comply (when pigs fly). Who actually confirmed this? There are no motorcycle tire manufacturers making winter or M + S tires. Nicely thought out legislation that. I’ll be riding my bike on said roads whenever the ambient temperature is above freezing conditions. Good article. Thank you. However, I must point out that you indicate in your article “B.C. RCMP”. Just in case you haven’t noticed for the past 100 years or so, the RCMP is not the only Police Force in this Province.!! There are at least 13 others !!!!! Thanks for the feedback Bob. You are most certainly correct – the B.C. R.C.M.P. are not the only police force in the province, there are many other great men and women serving the municipalities and regions of B.C. The B.C. R.C.M.P. helps us with enforcement on highways outside of those municipal and regional boundaries. Thank you for this information. I emailed ICBC to find out if M+S tires were acceptable or not, and have not heard back, so this page helped me and a few concerned co-workers who don’t have the Snowflake symbol but DO have the M+S label (with good tread). Good to hear that Andrew. Let us know if you have any other questions! Good winter tires are a must on certain BC highways I agree. However I believe driving habits of people on hazardous routes play a very important roll also. I have been driving the highway 5A between Merritt and Hope on several occasions when the conditions warrant speeds of about 60-70 kmph, and have been passed by private vehicles and Transport trucks at speeds that are unbelievably fast. On more than one occasion a few kilometers down the road the vehicle has run off the road. I think people with winter tires believe they can drive at the posted speed limit and still be safe, a false sense of security. How about considering electronic highway speed signs similar to the ones used in the cities around schools and play grounds. Could these signs be hooked up near the highway cams and programmed to change the speed limits when conditions get really hazardous? Thank You. Hi Allan, thanks for the feedback and your great suggestion. We will forward it along to the traffic engineering department for consideration. On the radio today, was that BC RCMP have been giving fines for no winter tires – no snowflake! and what RCMP do, and what consumers are told by their tire service people / automotive repair shops. Thanks for connecting with us and letting us know your concerns. The contents of the blog above are the official word on winter tires in BC. M+S tires meet the minimum requirement for winter tires in BC. While tires with M + S designation are sufficient for use in winter conditions, we recommend using tires with the mountain snowflake symbol because they have been designed specifically for use in extreme winter conditions. Tire shops might be promoting the use of tires with the mountain snowflake symbol because they are the better choice of the two tires in winter conditions, but current legislation does identify M+S tires as the minimum in winter tires. The BC RCMP should not be issuing tickets to vehicles with M+S tires unless they have less than 3.5 millimetre of tread depth or are in poor condition. All tires, whether they are M+S or Mountain snowflake symbol should be in good condition with the minimum tread depth of 3.5 mm. BC RCMP can ticket drivers with either type of tire if they are in poor condition, because the use of those tires would put the driver and others travelling on the road at risk. Hope that this helps clarify the confusion, please let us know if you have any other questions.